Not only that, your card is a key component of your branding. So when it’s time to design your business card, create a card that's not only memorable, but that's worth keeping. What Are the Upcoming 2018 Business Card Trends? Despite advances in technology, the business card remains a valuable networking tool. Just because business cards have been in use for centuries, however, doesn’t mean your card needs to look old-fashioned and dated. Read on for a closer look at the top ten modern twists on an old favorite. These will keep your business cards looking fresh during the upcoming year. When minimalism first emerged in 1960s New York City people were drawn to the style’s refreshingly simple lines. Today business owners are shifting to a more minimalist look because it is clean, direct, and straight to the point. If you want to focus on what’s really important, try a minimalist business card. For an elegant touch, go with minimalist black. In 2018, the thicker the cardstock, the better. To show your clients you are committed to delivering quality and substance, go with a card printed on ultra-thick cardstock. This year business owners will have their cards printed on 24-point cardstock when they want to make a lasting impression on their clients. Bold. Strong. Exceptional. Want to make sure your clients remember your company’s name? Make your business name the star of the show by using over-sized typeface to make it a headline that’s hard to forget. Over-sized typeface business cards are for the company owner who wants to be viewed as a strong leader in their industry. When your business card designer and your web designer collaborate, magic can happen. Mirroring your website’s design on your card will help your clients to recognize you on sight. This is going to be one of the biggest trends in the upcoming year as more companies streamline their web design to maximize the combination of user-friendliness and today’s aesthetic. For the business owner who wants to be limited only by their imagination, die-cut cards are the way to go. Die-cut cards can be designed in a variety of ways, and their fun shapes will make you stand out from your competitors. These cards add dimension to your image, and they will tell the people you hand them to that you are a cut above the rest. You may not be familiar with painted-edge business cards, but get ready to see a lot more of them this year. No matter how you look at them, these cards look incredible. Adding a splash of color to the edges gives these cards a vibrant, energetic appeal that will get customers excited about your brand. When you really need it to pop, go with a painted edge. Help your clients to feel strongly about your brand by giving them something to taste, touch, or even smell. Wood, cardboard, leather, elastics, baked goods, and more – if you can print on it, you can make a business card out of it in 2018. Using the tactile sense helps us process information, and this is one sensory experience your clients won’t soon forget. If you'd like to read more about tactile business cards, check out our article, Are Unique Tactile Business Cards the New Norm? Geometric templates are organic and appealing to the eye. Like DaVinci’s Golden ratio, there is something so satisfying about the Divine proportion of a rectangle, the symmetry of a perfect circle, or the angles of an off-beat triangle. 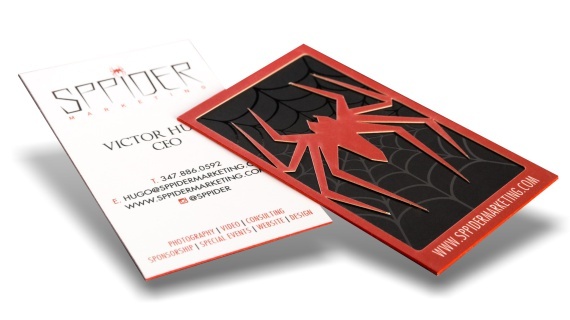 A geometric business card tells others that your company offers creative and innovative solutions. Psychological studies have shown that concentrating on an object so you can learn and understand will help you to remember information. What better way to get your clients to focus on your company’s message than to put it on an interactive card that features a puzzle, windows, sliding pieces, or even transformable card will be all the rage this year. These smart cards will show your clients that you are a modern company that stays on top of the latest technology. Digital business cards will get you new business lead and help drive traffic to you. To make a statement that says you are cutting-edge and you’ll never fall behind the trends, consider a digital business card. Your business card is an area in which quality, creativity, and careful branding count, and this is not an area where you want to skimp or cut corners. You only get one chance to make a fantastic first impression, so take time thinking about what you really want to tell your customer base about who you are and your mission statement.